I used Thai eggplants/brinjals to prepare this delicious no onion curry. Want to add cilantro/coriander leaves to your diet? 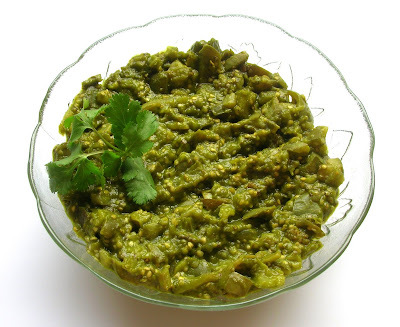 here is a wonderful curry that goes well with white rice or even rotis. Infact, I used it as a bread spread too. Here goes the recipe. 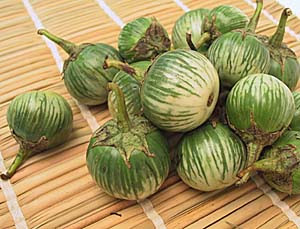 Dice the brinjal and add it to water as and when you cut. Drain water from the eggplant, (leave away the seeds that are in the water) and add the diced brinjal and fry until half cooked stirring occasionally. 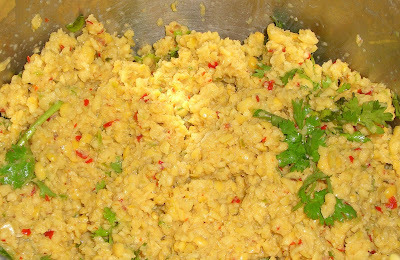 Add the ground coriander paste and mix well. Cook covered until the all the moisture is absorbed. Stir occasionally to avoid sticking to the kadai. That's it. The curry is ready. Serve with white rice and ghee. Yes, we have a get-together coming up on Feb 16, 2008. 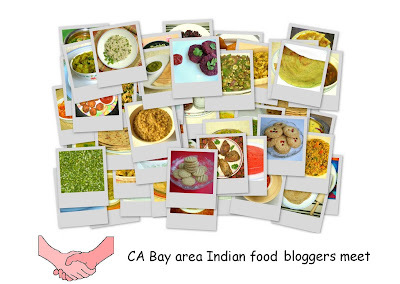 If you are an Indian food blogger and you reside in and around the bay area, California, or if you reside elsewhere and you think you can make it, please join us. Details HERE. The venue is in Sunnyvale and the Agenda is 'Meet fellow bloggers - Eat Food & talk food and nothing more!'. I have been wanting to try this recipe for a long long time. 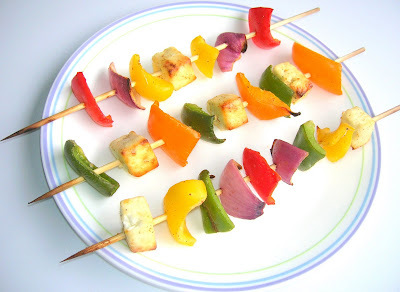 After having seen many recipes for Tikka, I made a list of the most important ingredients, shopped for colorful capsicums and my favorite nanak brand paneer, set off to try this excellent colorful Tikka. This is my entry for Pooja's Theme of the week event. This time she has selected the tri color of the Indian flag - Orange, White and Green, in connection with the Indian Republic day (Jan 26th). Thanks Pooja for hosting this event. Here is the recipe. 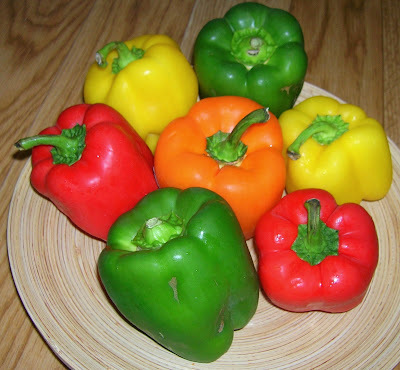 Chop the bell peppers into 3/4th inch squares. Chop the Onions take out the layers. 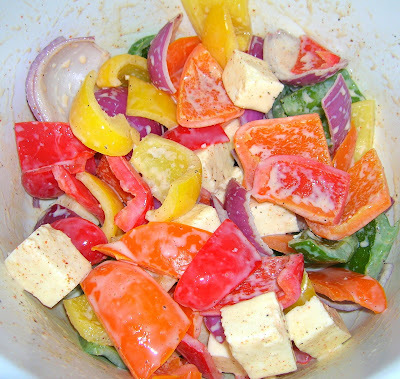 Transfer the vegetables and paneer into a large bowl. Take a small bowl and mix the ingredients listed for the Marinade. Pour it over the chopped vegetable mixture. 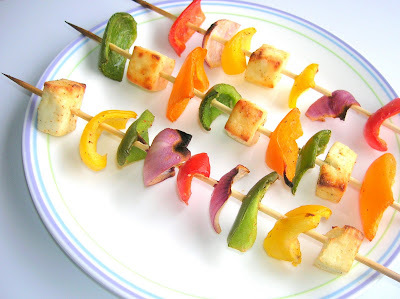 Mix well so that each vegetable and paneer is coated with the marinade. Allow it to marinate for half an hour. 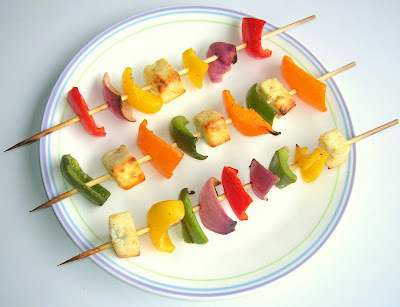 Carefully thread the vegetables and paneer in the skewer and place 4 to 5 skewers in the oven. Squeeze the Lemon on the Tikka and serve immediately. Tastes best when grilled instead of keeping in the oven. But oven method is perfect for winter days. 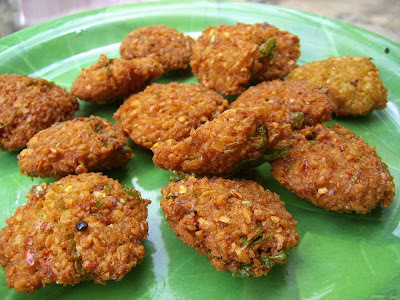 This recipe is by Renuka R, a featured "Chef" on Ammas.com. 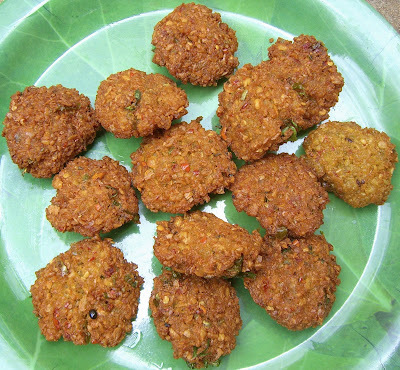 This Kaara Kuzhambu is a typical south Indian delight and is a tasty, spicy dish especially during winter. I altered the recipe a bit, but the base recipe is Renuka's. Thanks to her. This is my entry to JFI Onion hosted by Radhika. Thanks Radhika, for hosting this event. Tamarind - 1 big lemon sized ball. Blanch and remove the tomato skin. Chop and keep it aside. Chop the remaining half onion. Heat oil in a kadai. Add the mustard seeds. 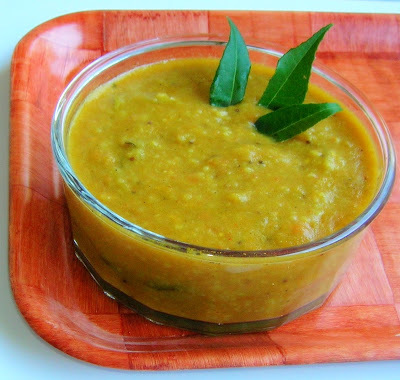 when it sputters, add the urud dal, green chillies, curry leaves, cumin seeds. Add the onion and fry until tender. Add the tomatoes. 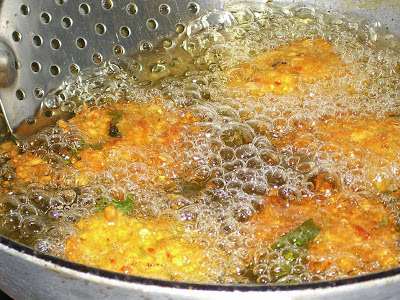 Fry for a couple of minutes and add the ground masala, turmeric powder, tamarind, red chilli powder and salt to taste. Pour 2 cups of water and allow it to boil. Stir occasionally. After some time, the kuzhambu will start thickening. Add the Jaggery. Stir and turn off the heat. Serve it with hot white rice. Can also be served with Idlis and Dosas. Here is a cool recipe from my dear friend Priya. 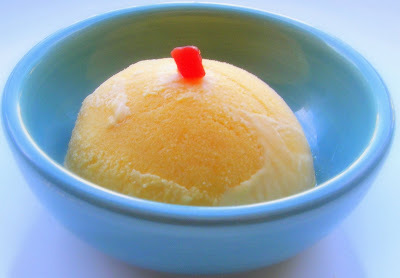 With just few ingredients, she perpared delicious creamy mango ice cream. I am sharing the ice cream and the recipe that she gave me. Thaw the cool whip to room temperature. 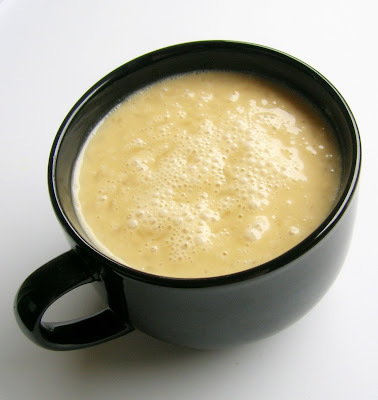 Mix all of the above ingredients thoroughly (don't have to use a blender or a mixer, just mix all ingredients) and freeze. Mango ice cream is ready. 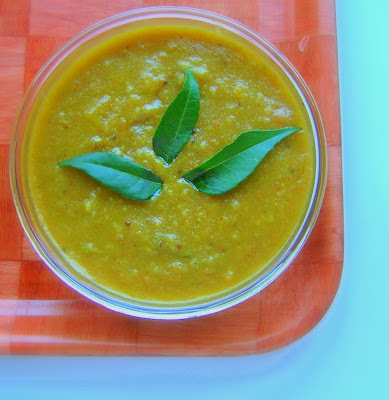 Substitute ground almonds, saffron and elaichi for wonderful kesar pista. Use rose essence and rose coloring for rose ice-cream. You can try other flavors using the above method as well. 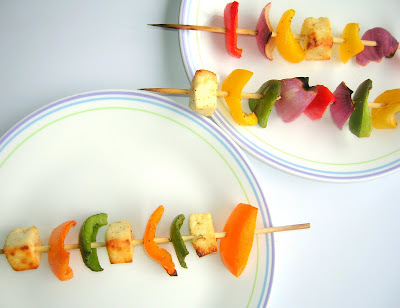 This is my entry to "Recipes for the rest of us" event hosted by Ramki of One page cookbooks.